A month or so ago, I logged into my email and found a Groupon in Cincinnati, OH for Paint by the Glass in West Chester, OH. I had never heard of this place, but I love painting and upon reading more information, I was pretty sure I’d have a good time. The schedule really varies, so I’m not going to put their hours up. Generally, the adult classes are in the evenings and the kids classes in the afternoon (2pm) but you’ll have to go to the website to check out the calendar. The calendar features which painting they are working on which night, so you can choose the class you’d prefer to attend. 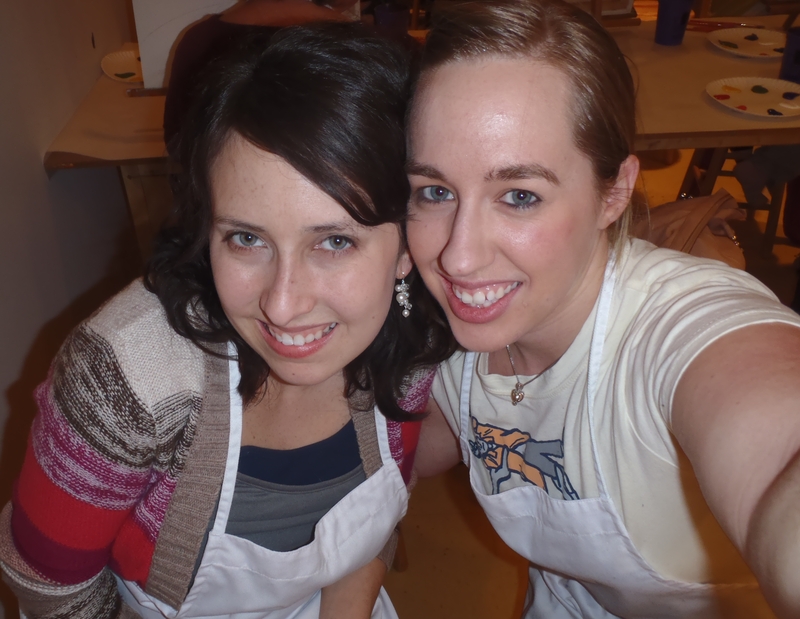 My friend, Lanna and I went the Saturday before Valentine’s Day and had a really great time. 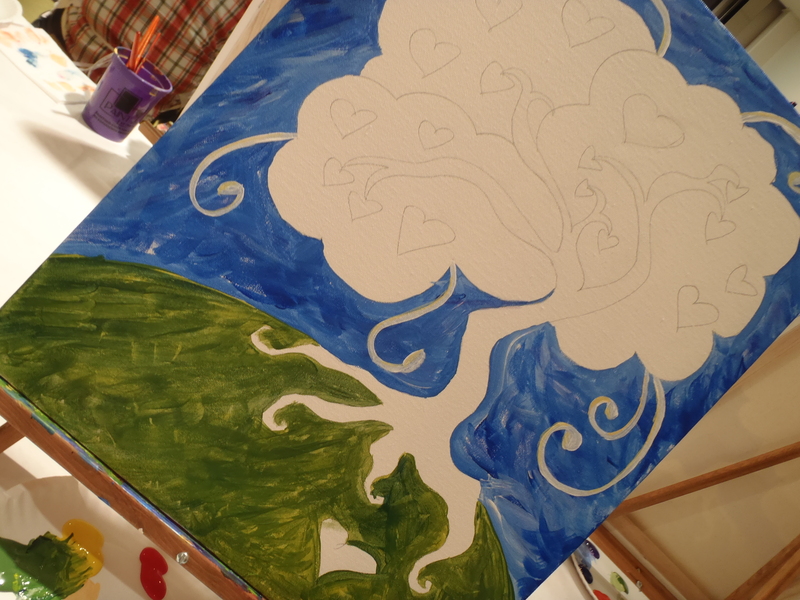 The painting was called “Love Tree”, for obvious reasons. I was surprised to see so many men there, but it was a predominantly Valentine’s Day theme, so, I’m sure many of the guys were forced into it. I did see one couple in particular, where the guy was just observing his SO painting and didn’t seem to be much preoccupied with anything else. Anyways, since I’m not really a fan of Valentine’s Day, to spend an evening doing something crafty with my best friend was all I could have asked for this year! We also sat at a table with a cool, trendy Christian couple and had a lot of fun talking and joking with them. At each table there was an easel with an unpainted canvas, an assortment of brushes, and a plate with all the primary/secondary colors and white. Oh, and of course, a cup of water. On the canvas, as shown to the right, the basic picture is sketched in pencil, so it’s like a paint-by-number without the numbers. I wasn’t sure how I would feel about that, but it was really nice. The artist (I forget her name! boo) was really great at helping us through the process. It’s been ages since I’ve painted on canvas, so getting the pointers was really helpful. Like, wetting your brush before blending colors. When I paint on wood, that’s not helpful, because then it thins out the color which means I have to do multiple coats and if it’s a blended color, I don’t always have a lot of it. But this tip was good for both surfaces: Start from the furthest area “back” and come forward. Basically, start with the background and build on top of it. 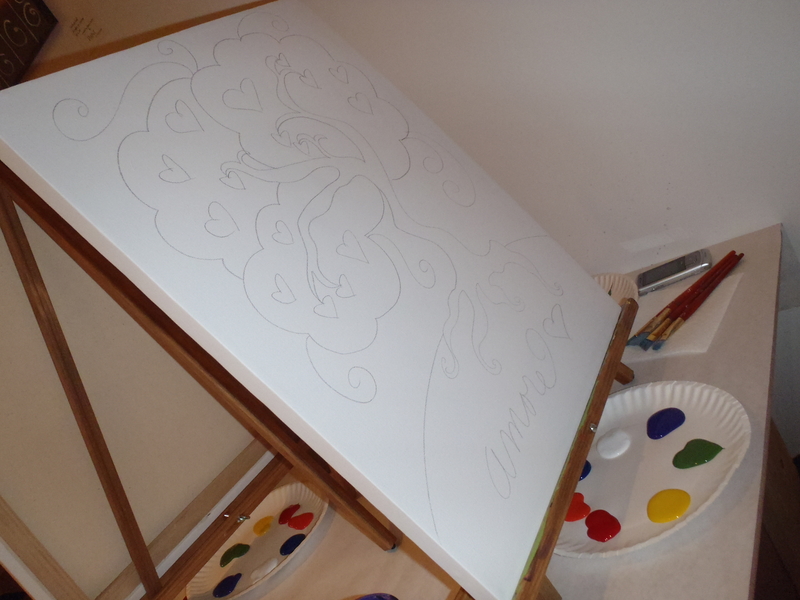 I usually do this when I paint on wood, but I wasn’t thinking about it for canvas. So we built and built and painted and painted and blended and blended. At this point, we took a “break” and were able to eat some of the yummy hors d’oeuvres they were serving; chocolate-covered strawberries, meatballs, veggies. By the way, they serve wine and such in the evenings. If you’re not savvy to that, they also have pop available (not a huge selection, but good enough). 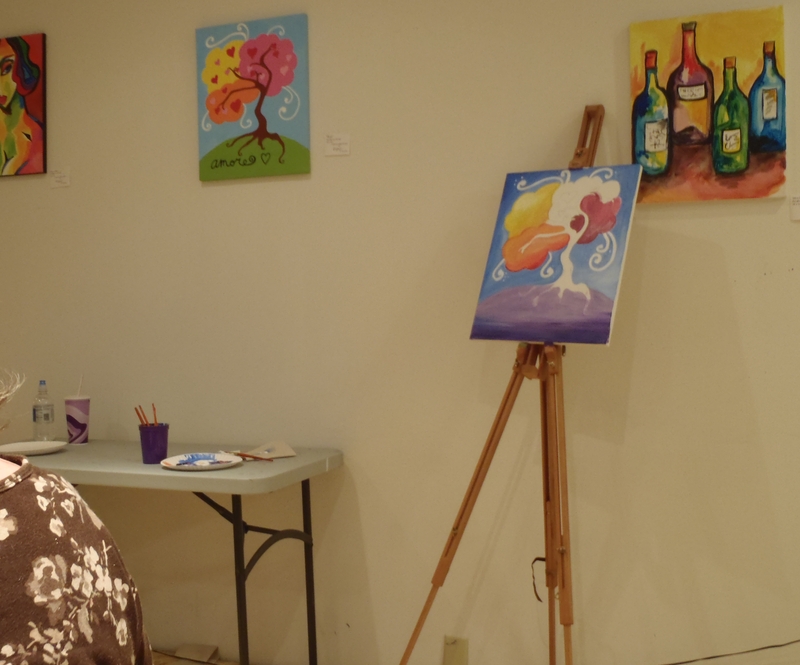 They also have a kids class called “Canvas & Cocoa” which is in the afternoons on Saturdays, with age-appropriate paintings with a drink/snack served as well. I’ve also seen a “Canvas & Causes” class posted on their calendar where certain amount of the class fee goes to a good cause. The painting seems to be related to the cause. While we were painting, the artist/teacher was painting along with us, at pace, so we could see technique, ask questions about brush selection and blending, etc. What I really enjoyed about the class is that everyone was of a different level of ability. No one was excluded. Also, you could choose whatever colors you wanted, and the style of painting could be whatever you felt most comfortable with, or maybe thought would best fit your home decor. She coached but didn’t dictate or criticize. I felt like I was back in any of my high school art classes where creativity and exploration was encouraged and only technique was taught. The class: Really fun. Casual. Definitely felt like an art studio. Our class was scheduled to go from 6:30p-8p. I don’t think we left until a little before 10p. But they were gracious hosts and didn’t make us feel rushed or try to shove us out the door. The food: For hors d’oeuvres, excellent. Just don’t go expecting them to take care of a meal. You’re there to PAINT not dine! The help: Everyone there was great. The artist/teacher, it was apparently her first night, and she did a wonderful job! Whenever we needed something, extra paint, another plate, more water, a paper-towel, etc, they were quick to get it to us. The parking: It’s in a strip-mall across from Kroger and there is lots and lots of parking in the lot there. The accommodations: The room is narrow but it’s easy to get yourself around the table to the food, drinks, restroom. I was sitting pretty close to the artist/teacher, so I didn’t have any problems seeing. I didn’t check from other parts of the room though. The price: For the adult class, it’s kind of pricey, by my scale. $35 for adult classes. $17.50 for Canvas & Cocoa. There is also the option to schedule a private party, but there are no pricings available on the site for that. 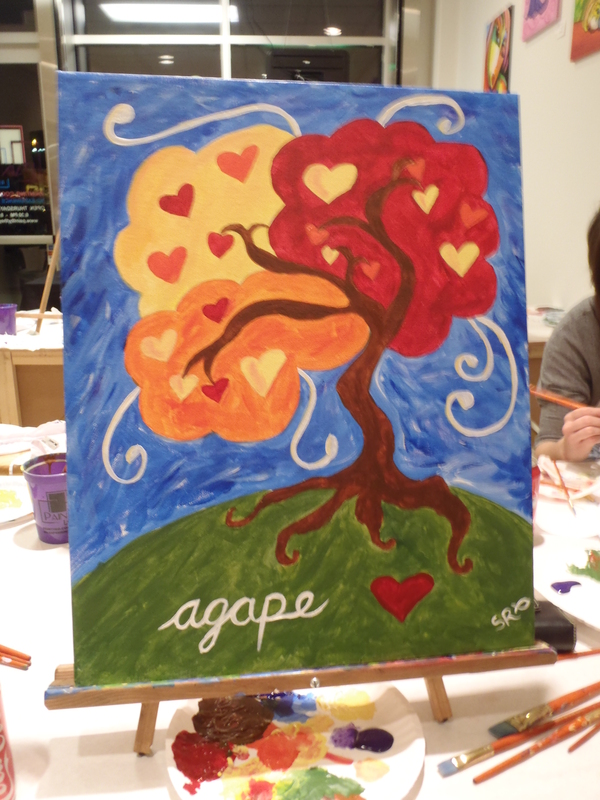 This entry was posted in Businesses, Cincinnati Businesses, Cincinnati, Ohio, Review and tagged Canvas, Cincinnati Art, Cincinnati Business, Cincinnati OH, Coca-Cola, Groupon, Kroger, Paint, Paint by the Glass, Valentine's Day, West Chester OH. Bookmark the permalink. you linked Valentines Day. Hilllariouuus.